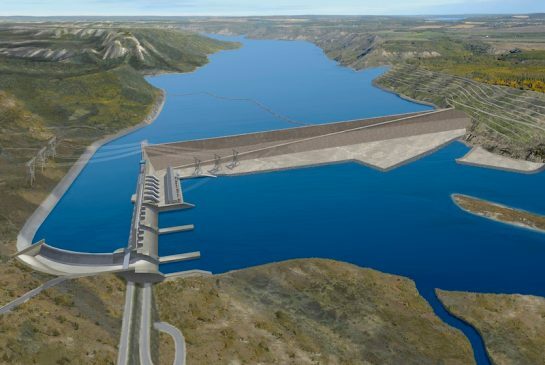 Is Site-C hydro project on the Peace River a good idea? Absolutely! There may be missteps in the project as it is currently being undertaken, such as failure to fully resolve aboriginal land claims. These issues can and must be addressed fairly and squarely by due process. But the project itself is an essential step for ending our hydrocarbon energy dependence. In a famous 1905 paper, Albert Einstein gave the scientific basis whereby sunlight could be converted into electricity. Basically, the photoelectric effect he described says that a photon of visible light, when absorbed, releases an electron. Although few foresaw it in 1905, his insight has lead directly to solar panels, which convert sunlight into electricity, without any moving parts. After about a century of development, we have learned how to capture those released electrons, “round them up”, and herd them into useful electrical power, through the magic of semiconductors. Solar photovoltaic panels have been mass-produced since about the year 2000, while their cost per watt of capacity has tumbled to few percent of what they they were back then. They are made from silicon, the second most abundant element in the Earth's crust. They last for a long, long time. Solar photovoltaic electricity is without a doubt the future of energy. It can provide all the energy we could ever need in the future, so long as the sun is shining above the horizon. They even produce electricity (though not as much) in cloudy daylight! This is now the cheapest form of new energy, costing as low as 3 cents a kilowatt-hour in projects now underway in the sunniest regions of the planet. Here at higher latitudes, it's not quite that cheap, but still a bargain. It competes well with our current BC hydro base rate of 8.3 cents per kilowatt hour. Considering that our BC Hydro rates are the third lowest rates in North America (after Quebec & Manitoba), that's still a bargain. Almost everywhere on Earth, solar photovoltaic can outcompete fossil fuels on basic energy costs. But Einstein didn’t tell us what to do when the sun goes down. For that we need stored power to provide electricity on demand. That's where Site C becomes really, really important. The only efficient way to store power on a massive scale - other than as hydrocarbon fuel - is water stored at elevation. Batteries can’t and never will be able to store such massive amounts of electrical power. It defies the basics of chemistry to think they ever could. The only efficient way to store energy chemically is as hydrocarbon bonds. That's why our human bodies store energy as fats (and carbohydrates in general), remember? But actually, we’re trying to get the planetary energy diet off hydrocarbons, and for a very simple reason. When used, hydrocarbons produce carbon dioxide. To much of that in our atmosphere, and our planet is cooked. Just ask Venus if you don't believe me. Our present release of CO2 emissions is cooking the planet Earth. It has done so in the past; this time we're bringing it upon ourselves. Intelligent species don't kill themselves by their energy use. What Site C will add to the existing Peace River hydro developments is not just more electrical generation (actually 5,100 gigawatt-hours annually, with 1.1 Gigawatt capacity as presently being constructed). More importantly it adds huge flexibility in when that power can be generated. Behind the W.A.C. Bennett Dam (Site A) is over two years of river flow in the reservoir. However, it can't be released on an as-needed basis without over-flooding the downstream Peace Canyon Dam (Site B) reservoir, which holds only 2 days worth of flow. The new reservoir at Site C will hold about 22 days of river flow, enough to smooth out the day/night and weekly fluctuations in power demand without causing downstream flood or drought conditions. When completed, the three reservoirs of the Peace system will be able to deliver energy on demand, even when the sun has set. Let's remember what made fossil fuels so wonderful in the first place: they are there when you need them. Multi-reservoir hydroelectric systems like the Peace River and like the Columbia River overwhelmingly offer our best opportunity to have hydrocarbon-free, as-needed power. Let's not blow this opportunity to save the planet from being cooked by carbon dioxide overload of Earth's atmosphere! Because of British Columbia's very special combination of topography and rainfall, we have the best sites in North America for storing hydroelectric power. Anyone who tells you that we shouldn’t optimize this gift of energy has probably been consciously or subconsciously brainwashed by the fossil fuel lobby. Also, he/she doesn't expect to be around when things really heat up. It's really very simple. Stored hydroelectric power, coupled with solar photovoltaic power, will save the planet. Sounds like a good deal to me! We have a HUGE opportunity here. Let’s seize it, use it wisely. Cheap, abundant power for all. A better future is actually possible!